Choosing model building materials for your model boats may give you pause. Wood is probably the most common, but plastic card, fiberglass, metal and cardboard have their place too. Some have no problem at all picking out model building materials, while others really struggle and don't know where to begin. The list presented here is a mix of materials I like to use for my model boats. Regardless of your preferences, you always have to consider what tools and work area you have available. The main purpose for the list of model building materials is to throw around some ideas and opinions in case you're not sure what to use. Sometimes it may be a good idea to just test a material and see if you like it. If that's the path you choose, start with a modest project. It can be a challenge to finish a big project with model building materials you don't like to work with. Wood is the most versatile of all model building materials. Different woods have different properties - not only the superficial such as color and texture, but also when it comes to stability, stiffness and strength. Less obvious properties that come into play are: prone to checking and ability to bend without cracking. To read more about different wood species suitable for building model boats, follow the link above. 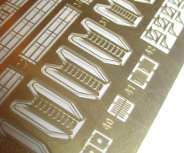 Example of model building materials: Photo Etched Brass. Metal is one of the most important model boat materials, especially in mechanical components in working models, and where fine details can't be reproduced in any other material. Here is a run-down on the most common metals used in model boat building. Fiberglass is most common in the form of strand mat or woven fabric. It can be used in combination with a resin on the outside of a wooden strip planked hull to seal and stiffen it. This is most common with RC model boats. A hull can also be made entirely out of fiberglass (and resin). It requires that a positive pattern (also called a "plug") be made first. After the pattern is properly finished and treated with release agent, a negative mold is made from the "plug". This mold now looks like a tub. After the mold is cleaned up and again prepped with release agents, hulls can be made from the mold - one after another. A mold typically lasts to make several hulls (10-20) before a new mold has to be made from the plug. All in all, this is a time consuming process, and doesn't really pay off unless you plan on making several identical hulls. There is a lot more to it than explained here with mat weights and types, layup schedules, pigments, gel coats etc. Carbon fiber and Kevlar are closely related to fiberglass in terms of working methods. If you are thinking of building serious competition models where every gram counts, this is what you need. The resin used for fiberglass hulls are generally either polyester based or epoxy based. Messing with polyester resin is smelly and you have to have the appropriate facility to handle it, or work outside. The good news is this stuff is cheap. Epoxy on the other hand has very little odor, but is considerably more expensive. Note that "lay-up" epoxy is different than your average "glue" epoxy. Typically it is a lot less viscous. Styrene is the same plastic most plastic kits are made from. Its only natural that kit builders who wants to extend kit bashing or scratch building choose styrene. This material is most common for static display models, but is also favored by some RC boat builders and professionals. If you've ever built a Guillow's balsa model airplane, you know what I'm talking about. This type of tissue paper has been used for centuries for sealing, and dealing, with the 'fuzz' that you'll see when sanding balsa wood. Instead of pore-filling and the tedious back and fourth with applying sealer and sanding you can simply lay the tissue flat over the balsa and apply 'dope' over it. You can read more about the process on the Tissue-and-Dope page. Paper, Card stock, Fiber Board, and Bristol board are all pulp and paper based model building materials. It's easy to assume paper is flimsy and fragile, but that's not necessarily true. Click the heading for more on Paper in Model Ship Building. Foam can be shaped much like a piece of wood and finished with fiber glass - not that different from how a surfboard is made. The dust gets static when cut or sanded and can be frustrating. On the other hand it is relatively inexpensive. If you are looking for model building materials to carve for a large model boat, this may be the ticket.